The black boxes that record events leading up to aircraft crashes must hold more data and have a more reliable power supply under a plan outlined Thursday by the Federal Aviation Administration. 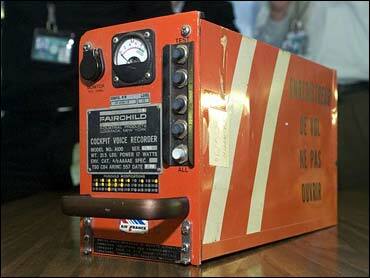 Federal safety regulators have long urged the FAA to adopt stricter requirements for the black boxes after the devices failed to yield useful information during the investigations of several fatal airliner accidents, including the 1998 crash of Swissair Flight 111 off the coast of Halifax, Nova Scotia, and the 1999 crash of Egyptair Flight 990 off the Nantucket coast. "Good data is often the Rosetta Stone to deciphering what happened in an aircraft incident and what could happen in an accident," said FAA Administrator Marion Blakey. The new rules require cockpit voice recorders, which record pilots' conversations, to retain at least two hours of audio and have a 10-minute backup power source. They are now only required to record 15 to 30 minutes of sound and don't have to have backup power. Flight data recorders, which record the movement of cockpit controls, must sample data more often. Now, they have to measure data every second; the proposal would require sampling every 1/16th of a second.